reliable and your job easier. installer, no additional downloads are required. PRTG is a network monitoring tool that helps you to ensure that your computer systems are running smoothly and that no outages occur. Network monitoring is also important to increase the efficiency of your network by knowing bandwidth and resource consumption. 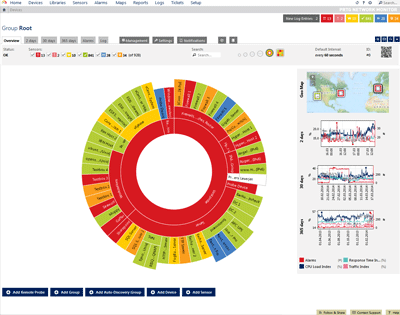 With over 200,000 active installations, PRTG Network Monitor is Paessler's powerful and widely-used network monitoring software. Eliminate server performance problems and bandwidth bottlenecks. Notifications of outages by email, ICQ, pager/SMS, and more. All common methods for network usage data acquisition (SNMP, Packet Sniffing, Xflow, IPFIX) ought to be supported. 200,000 system administrators worldwide trust our software. The mere implementation of a network monitor is not enough. The key to effective network monitoring in real time is to ensure that the chosen tool has been configured to monitor what are essentially a network's vital signs: availability, speed and usage. Monitoring network availability allows both internal and external parties to access the services, including websites and you can determine whether the mail servers and leased lines are working. Monitoring network speed with bandwidth monitoring prevents your websites and network services from losing visitors or frustrate users due to slow-loading pages, files or images. Finally, usage monitoring enables you to accurately assess CPU load and learn just what sort of work the servers are doing at times of different the day. The free version of PRTG includes 100 sensors. 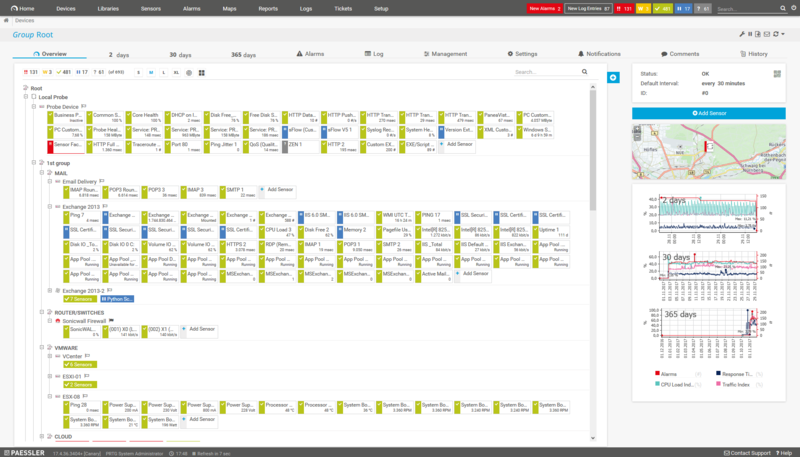 You will need one sensor for each individual monitoring entity. One sensor monitors for example one network service, one URL, one network connection, one port of a switch, one NetFlow export stream, one CPU load or one disk drive. So if you are looking for a free bandwidth controller, port sniffer or a tool for windows server monitoring or web site monitoring, PRTG Network Monitor is the perfect free network monitoring software for you. PRTG is easy to set up, configure and use – just download the installer, use the install wizard and set up your sensors with auto-discovery, and after a few minutes and just a few clicks, you are ready to monitor network activity, downtime of network devices or services, CPU load and much more. You can download a 30-day-trial version of our commercial licenses for free. The trial version comes with unlimited sensors. With the various infrastructure options in use today it can sometimes be difficult to decide which monitoring technology is right to solve your problem. PRTG offers unified IT monitoring that is intuitive to use. 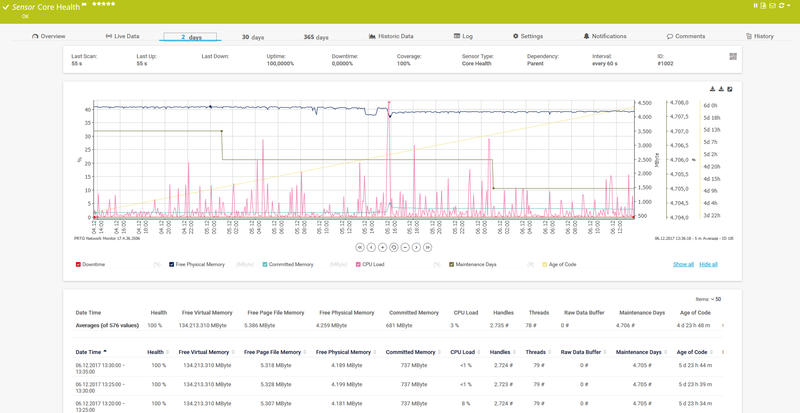 The autodiscovery of our free bandwidth meter makes the setup quick and easy. With its preconfigured device templates, it selects the appropriate sensor settings for servers, applications and network devices. Of course you can configure PRTG manually, too. 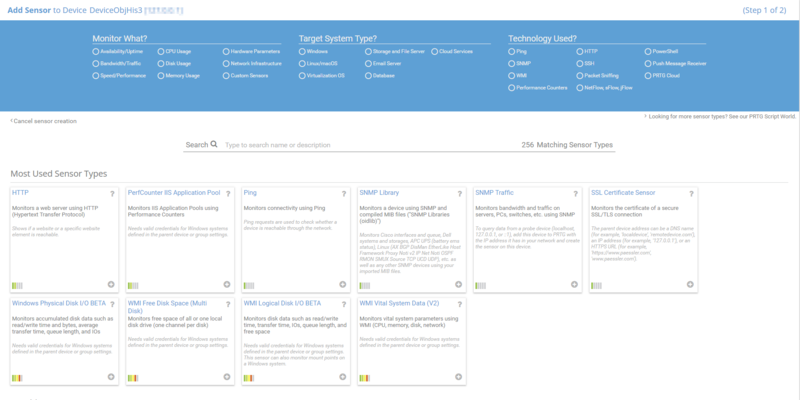 Download the free 30 day trial network monitoring tool. The trial supports unlimited sensors!